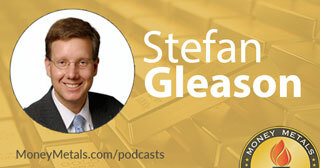 Stefan Gleason: The first reason to own gold and silver is not necessarily for these spectacular gains. Although, I think you are going to see those, at least in dollar terms. The first reason is to own it as insurance and as a hedge. But, particularly with silver, probably also with gold, there is a huge potential upside, even real terms. Right now, we are seeing negative interest rates emerge in Europe. We are seeing 0% interest rates here in the U.S. One of the big knocks on gold and silver is, “It does not pay any interest.” Well, neither does the dollar now and then on top of that you have the devaluation of the principal when you own dollars. So gold and silver are becoming very attractive assets. That is particularly been evidenced in the last few months. Gold and silver have done extremely well. So there’s definitely some real potential upside to gold and silver. Stefan Gleason: Well, usually, and certainly it’s the case with Money Metals Exchange, you can sell to the same people that you buy from. We’ll buy anybody’s gold or silver coins, bars and rounds. We obviously check it and ensure that it is what it is. We make sure we have it in our facility before we pay the customer, once we verify it. But we buy back and we would love to buy back. Unfortunately for us, most of our customers are just buying from us and very few are selling to us. So we actually have to buy from mints and wholesalers and the U.S. Mint and so forth. We’d love to buy more of our inventory from our customers because obviously we are buying from a middleman. We do make a market. Probably only about 5 to 10% of our inventory is sourced from our customers. We are eager to buy and we offer probably the highest, or among the highest, buyback prices of any of our competitors. We are as eager to buy from our customers as we are to sell to our customers. And that’s probably the case with most dealers. We are not retailers. We are dealers and that means that we both and sell. You probably would go back to where you bought it, but you do not have to. We buy stuff from people that they bought elsewhere all the time and are happy to do so. The items that we deal in are very standard. Recognizable. Liquid. Some people may want to sell to their local dealer and that’s fine too. They want to walk out with the cash. They may not get as good a price, but it depends on what your priorities are. There is no problem selling your precious metals. But that’s a very good question because a lot of times people say, “How do I sell? What do I do with it?” It is really about as easy to sell it as it is to buy it. You contact a dealer or walk into a dealer shop. They offer you a price. You give them the metal and they pay you. It’s that simple. It is about the same process in reverse as when you buy from us.